I had wanted to blog about the sermon I heard yesterday but I was still mulling about it. It's on John 16:16-33, where Jesus was speaking to his twelve disciples before he prayed the pastoral prayer in chapter 17. The gist of the sermon was that the greatest of things come through pain and suffering. Jesus's usage of the childbirth metaphor (16:21) points exactly to the fact that we will suffer and there will be anguish and pain. There will groaning and moaning. This is all part and parcel of life. But there is a purpose to the pain. It is temporary though it might feel like eternity and we will feel that we are stuck. But when the baby is born, the anguish will be turned to joy, immense and lasting joy. The basis of this joy is the very presence of the resurrected Jesus. The deep abiding assurance through his death and ressurrection. I love how the pastor put it but I was also wondering about pain. It is a necessity for us as his children, at least here on earth, that we suffer and bear the pain through him, so that we will be comforted through Christ, for he had suffered for us, for our comfort (2 Cor 1:3-5). It is through pain that we recognize who we are in Christ, sinners who need his redemption and salvation. But we don't look forward to pain. We want to avoid it. We prefer not to feel pain and suffering. We do not want to be stuck. And as much as we do expect life to be painful sometimes, we don't actively look for it, to flagellate ourselves with it. How then? Should we work hard to avoid it or should we welcome it gladly? This reminded me of a book I read more than thirteen years ago - The Problem of Pain by CS Lewis. I thought it was a good time for me to reread it and I started looking for its e-version. 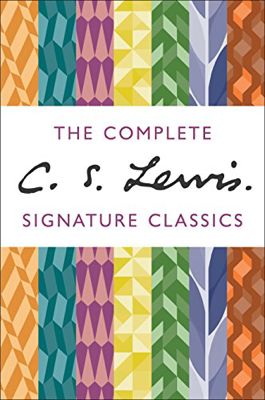 I found it in The Complete CS Lewis Signature Classics. The beauty of it was that it costs only $18.50. Its digital list price was $66.57! I bought it in no time. And I've started reading The Problem of Pain. I felt like I'm meeting an old friend, I have not read his books in a long time. Lewis's writing is just amazing. He writes profoundly but yet his words and phrases flows along flawlessly. I am not sure if his book will answer my question about pain, but I'm nevertheless looking forward to relearning what I've read so long ago and so long forgotten. In dealing with pain, I have found it helpful to remember that the experience is much like the grieving process. To heal we often have to step into our pain and release it.